We ponder a lot of what-if’s. What if she doesn’t accept my proposal? What if rain cancels the event? What if this baby is not born healthy? What if my new business venture is a flop? What if I can’t find friends at my new school? What if my marriage cannot be healed? What if God doesn’t come through the way I think He should? What if I really believed Jesus? You know Him. Really know Jesus. I mean, you can’t trust someone you don’t know. Jesus said, “If you really knew Me, you would know My Father as well. From now on, you do know Him and have seen Him… Don’t you know Me, Philip, even after I have been among you such a long time? Anyone who has seen Me has seen the Father… And I will ask the Father, and He will give you another Counselor to be with you forever- the Spirit of truth. The world cannot accept Him, because it neither sees Him nor knows Him. But you know Him, for He lives with you and will be in you” (John 14:7-8, 9, 16-17, emphasis added). To know Him. May it be our greatest pursuit. 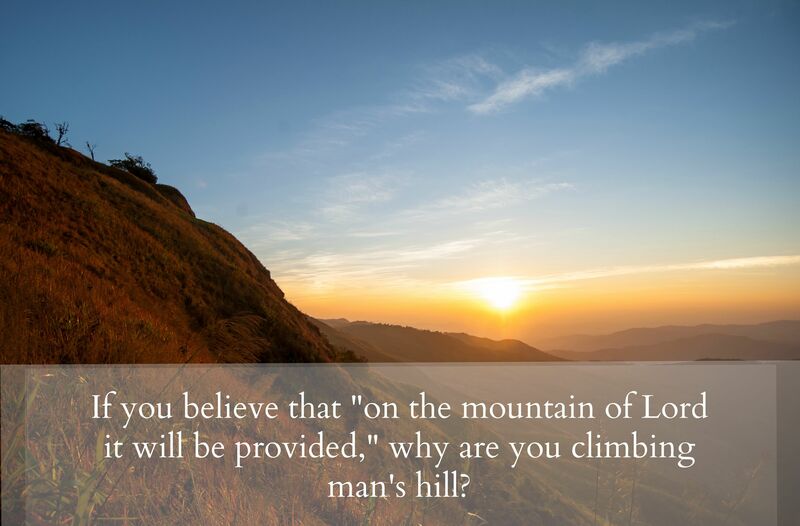 I’m reminded today of an individual in the community of faith who seemed more intent on climbing the hill of man even while the mountain of God was in clear view. He shared that he dedicated much of his time to the compilation of a 1000 pages of research on medical information that his family used for decision-making about treatment for a loved one. 1000 pages! He happily demonstrated with his hands how thick the notebook became after he finished adding the months worth of research. What if he really believed Jesus? What if the living, powerful words from the I AM were worth his time of investigation and recording in a binder? How might his spirit come alive with the possibilities of God?